With tLe Franc Tireur No. 6 (LFT6), it is possible to track the exact moment its editorial staff began taking steroids, as this issue ballooned in size, approaching 100 pages in length, and the number of included scenarios doubled that of the previous issue. The theme of LFT6 was the Spanish Civil War. 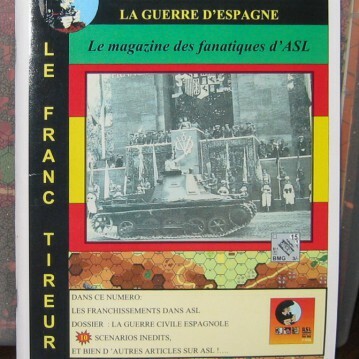 Accompanying articles (all in French) include a look at AFVs in that conflict, an overview of Spanish Civil War wargames (including but not limited to ASL scenarios), and a historical overview. It also includes photographs, including some in color, of some of the areas of fighting. 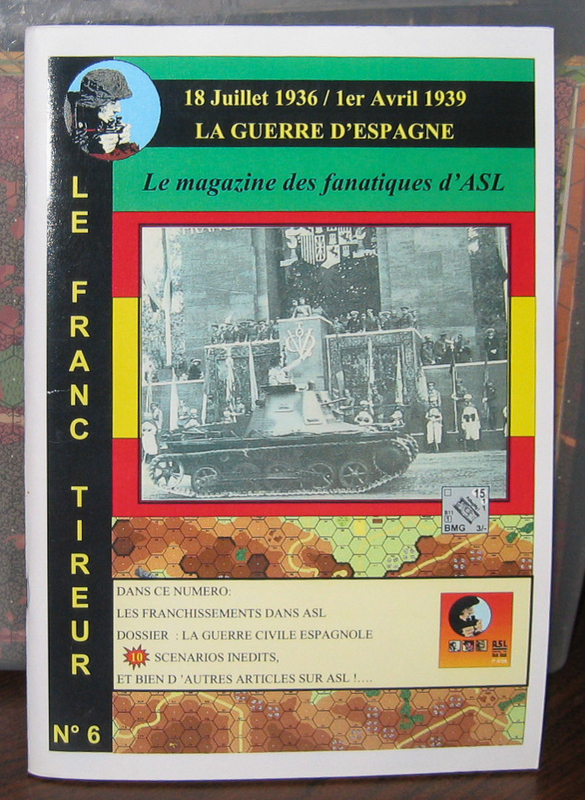 Other article content included a host of announcements and reviews of recent ASL-related products, an overview of an effort to translate the 2nd Edition ASL rules into French (which apparently was never completed), tournament reports, an overview of upcoming ASL products (some of which, like Ortona, still have yet to see publication, more than a decade later), a lengthy and interesting guide to rafts and assault boats, an ASL crossword puzzle (for people who have WAY too much time on their hands), an ASL poem, an analysis of strength factors in ASL, an overview of JASL (Lars Thuring’s attempt to create a virtual version of ASL with a computer player), and an interview with François Boudrenghien. All ten scenarios (in English) feature the Spanish Civil War; there is also a reprint of an old Spanish Civil War themed scenario that originally appeared in the French wargaming magazine Casus Belli. Except for the reprint, all of the scenarios are in English. 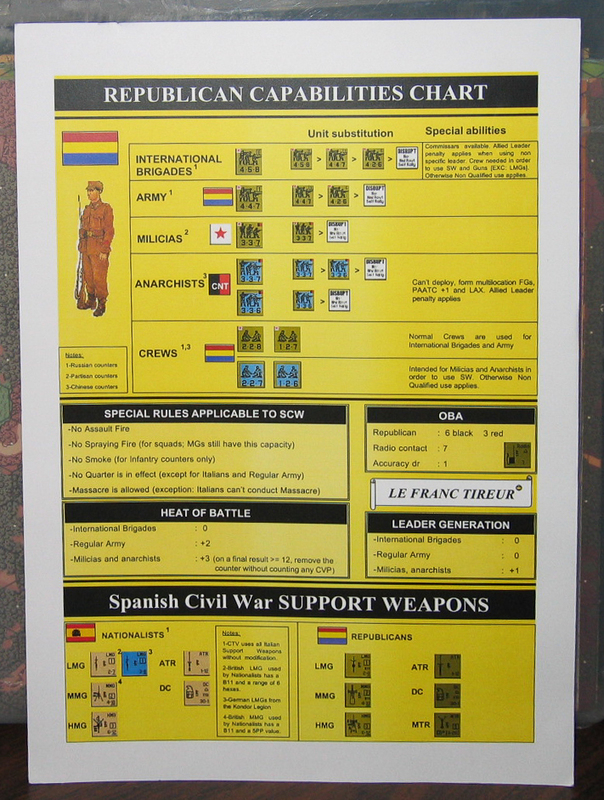 Le Franc Tireur does a good job of representing all the different forces that fought in the conflict, even without adding any counters. There is a good range of sizes, with an essentially equal mix of small, medium, and large scenarios. LFT6’s scenarios use Soviet counters for the Republicans and the International Brigades, Partisans for the Militias, and Chinese for the Anarchists. They use British counters for the Nationalists, Axis Minor counters for the Carlists and the Falange and, of course, Italians for the Italians. Of the scenarios, several are quite interesting. In one, FT19 (A Leches En Larache), the Nationalist player wins if he kills or captures the mayor of the town of Larache. Another, FT21 (Hill of Death) uses the geomorphic mapboards included in the Heat of Battle module High Ground!. FT22 (El Alcazar de Toledo), features an overlay of a massive stone building, El Alcazar. FT24 (¿Cuàndo Te Vas?) is an interesting tin can battle between Italians and Republicans armed with Soviet tanks. It is the most-played scenario of the bunch. FT27 (East of Tortosa) features a contested river crossing. There are a lot of interesting scenario situations here and perhaps this product deserves a bit more attention than it has so far received.